This worksheet contains two passages modified from the 7th grade middle school curriculum. The passages are summarized from two stories from the Bridges to Literateure text. The stories are simplified for students with special needs. The students are to read each passage and write at least one sentence as to how the passage relates to their personal experience. 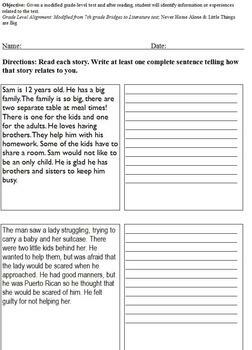 Students are required to think about their experiences and tie them in with what the characters in the text experience. Given a modified grade-level text and after reading, student will identify information or experiences related to the text.